High Quality Split-Rings For Key Holders! Combine Colors To Get Price Break! The 1" steel metal key rings are the most popular keyrings for most of applications. 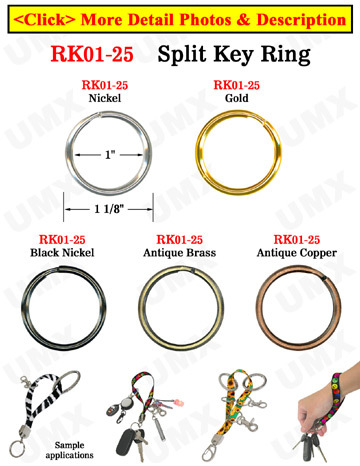 Not only for your keys, the gold, antique brass, antique copper, nickel or black nickel finish color split-key-rings can be used for small accessrories fasteners and binders. Custom Keychains: A variety of custom key chain size, materials and combinations available - call.